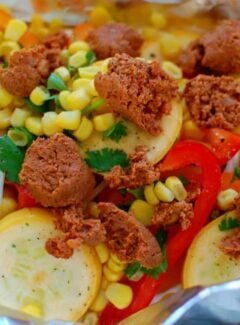 This sheet pan dinner is so good! Just ask MaryJo, my official taste tester, (I think she liked it)! 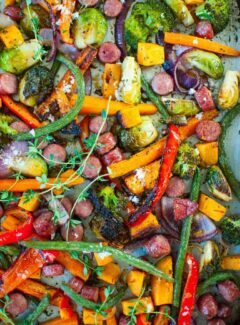 Roasted vegetables with sausage tossed with a number of spices to bring out the best flavors of the veggies is a meal you’ve got to try. Easy and tasty is in play here. I used a number of vegetables to roast…red bell pepper, sweet potato, red onion, broccoli, carrots, Brussels sprouts, green beans. Use whatever vegetables you have on hand. The spice combination is what makes this sheet pan dinner work. Simple spices each contributing their own quality to the vegetables. 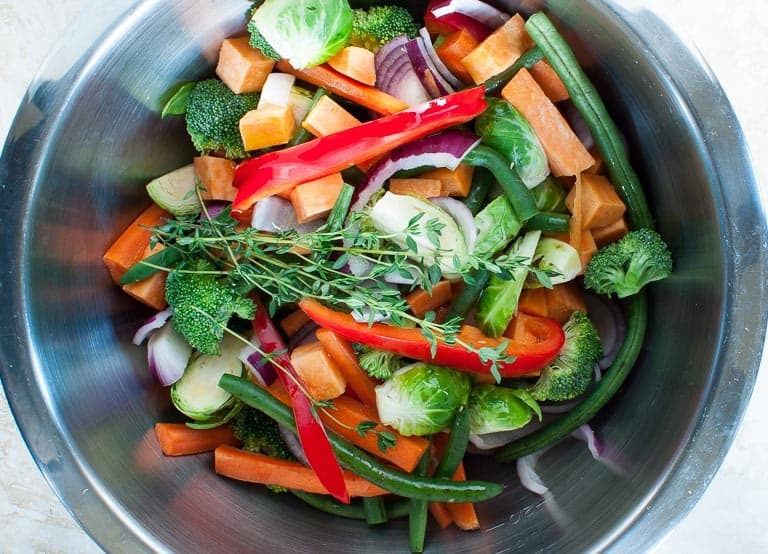 Place the vegetables in a large bowl with the olive oil and spices. 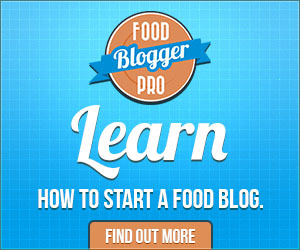 Toss to fully coat and then arrange them in a single layer on a large sheet pan that you’ve sprayed with cooking oil. Some people use aluminum foil or parchment paper to line the sheet pan. I find that everything will brown much better without the extra layers. Just spray the pan well with cooking oil to make for easier cleanup. Add some pork sausage links that you’ve chopped into coins. Potato sausage or Polish would be great. I used a breakfast sausage from Pastures a Plenty, a free range livestock farm, where the animals are free to feed on grass and alfalfa. And it is also a meat that my daughter Amy will eat. Place in a 400° pre-heated oven for 25 to 35 minutes until the vegetables are browned. You can stir this around after 20 minutes or so. Add extra sprigs of thyme once the veggies are done. Just strip off the leaves and enjoy with your meal for a nice flavor enhancement. 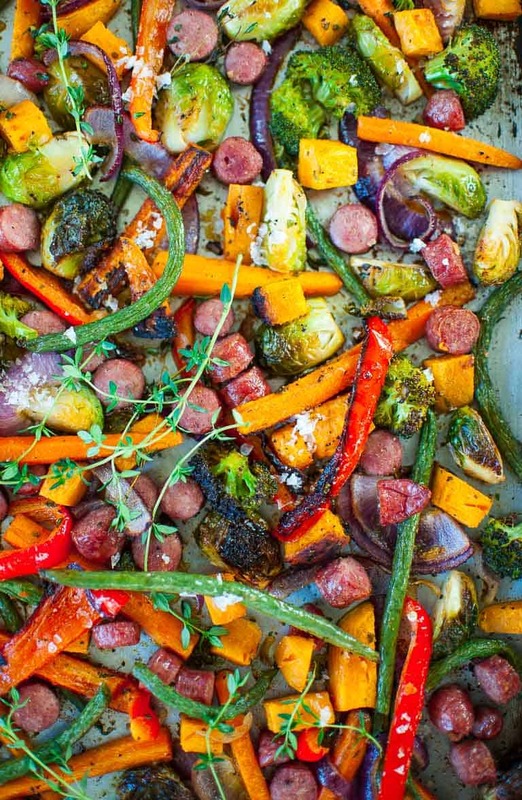 One sheet pan roasted vegetables are easy to prepare and totally satisfying. Give this meal a try. 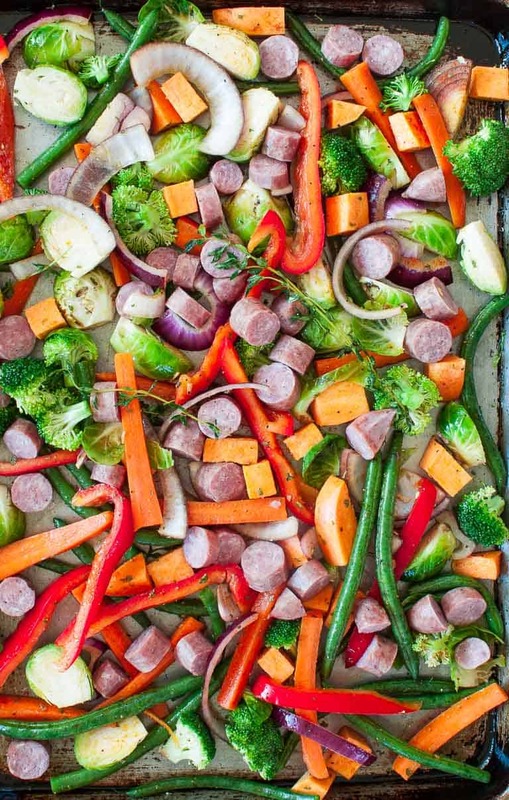 Delicious one pan vegetable and sausage meal that is oven roasted to perfection with killer spices. 3 medium carrots sliced to 1/2" by 4" pieces and microwaved for 1 minute in a plate with a little water. Wash and thoroughly dry the vegetables as needed then place in a large bowl, add the olive oil and spices and toss well to coat. 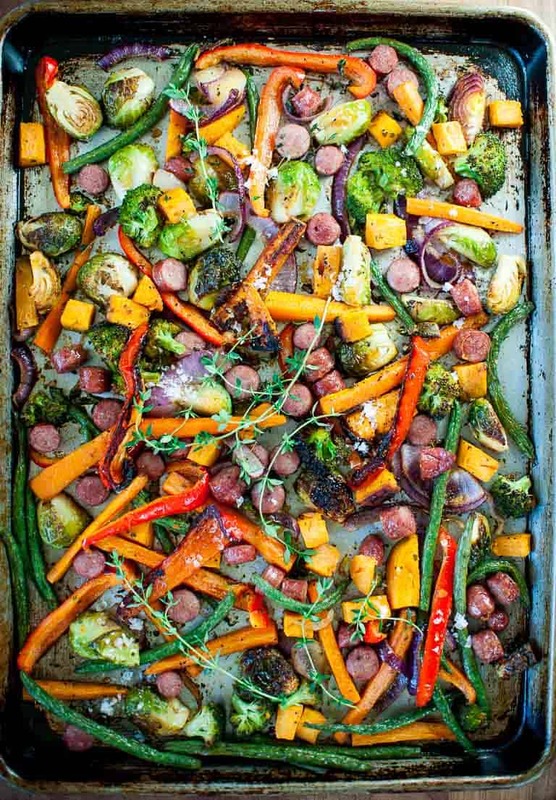 Spray a large sheet pan with cooking spray and add the vegetables and sausage in a single layer with a few thyme sprigs. Place in oven for 25 to 35 minutes until the vegetables are browned, checking the vegetables at 20 minutes and turning if necessary for browning. Remove from the oven, add a few more thyme sprigs, and serve hot. I microwaved the carrots on a plate with a little water for 1 minute to insure that the carrot is cooked well when roasted. Dry the carrots with paper towels before coating with olive oil. Roasted vegetables are absolutely the best. I can’t believe we have not been doing this all our lives. Thank you Joe for this reinforcing recipe! Your spice recommendation adds a lot. Thanks for the comment Alan. I know, my mom used to stick vegetables in boiling water until they were soggy, colorless and tasteless. Roasted, they are very flavorful. Seriously, this was excellent! The herbs and spices are a winning combination with the vegetables and sausage. 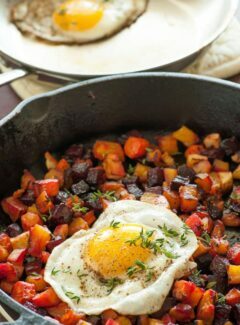 With all the beautiful veggies flooding the farmers markets, we should have this at least once a week with just a variation in the meat.